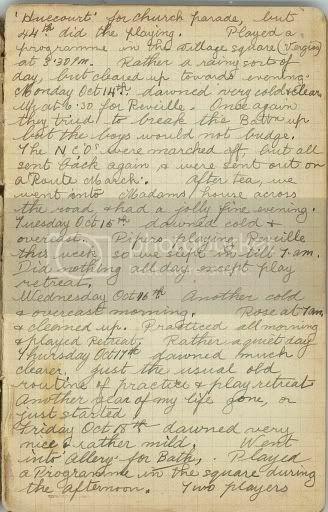 Sunday Oct 13th Slept in a little later, as there is no Reveille on Sunday mornings. Went into Huecourt for the church parade, but 44th did the playing. Played a programme in the village (Vergies) at 3:30pm. Rather a rainy sort of day, but cleared up towards evening. Friday Oct 13th up early to prepare myself for physiotherapy. Some clouds about, and humid, but probably no rain about.